During his long and prolific career as an archaeologist and prehistorian, Vere Gordon Childe was among the most influential of his or any generation. This slight, awkward Australian with round glasses and a felt hat was responsible for successfully transforming the way in which archaeologists treat their data – how we understand those things recovered from the earth, and how we then go on to talk about them. But perhaps his most unusual legacy was to influence – however indirectly you think it may in fact be – the wildly popular game series, Age of Empires (AoE). In this article, I’m going to consider some of the ways in which Childe’s thinking has been absorbed in a series that, with its first title released in 1997, is still going strong. For Childe, societies were best defined through those implements and objects that recurred spatially together. Because pot “A” is consistently found over there, we call that the “pot A” culture, and because pot “B” is always found over there, they are the “pot B” culture (I’m simplifying, but that’s the gist of it). But he went further than this, by saying that societies develop and evolve over time not out of some vague historical upswing, but through the transformations that take place in these arrangements of technology. So, when our friends the “pot A” culture developed a new kind of pot – cast in bronze, say – they entered the bronze age, and that is how we should map them out through time ; through tightly recurring concentrations of similar material objects which, when new or objectively “more advanced” versions were invented, produced changes in the social organisation of that culture. If you’re beginning to think that his theory of social-technological revolution sounds Marxian, then you’re bang on. So, what has any of this got to do with Age of Empires, and – perhaps more importantly – why does it matter? 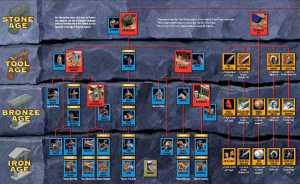 Age of Empires – for all of the changes that have taken place in its design and content – is based on an unchanging and fundamental mechanic ; that you pick a society (ahem, the “pot A” culture), who are discreet and coherent (they are associated with a particular style of buildings, clothes, and other materials), who you then lead through history via a series of technological revolutions – in other words, by climbing up the “tech tree”, which I have always thought would have been immediately familiar to Childe in its basic assumptions, if not in its details. Fundamentally, then, we can sum this mechanic up as ; culture + technology = social change. It is, in its broad scope, the same process described in Childe’s master-work, Man Makes Himself (1936), the process described above. It is interesting to learn, then, that the working title for AoE was “Dawn of Man” ; an echo of Childe’s own The Dawn of European Civilization (1925). As Childe’s proponents point out – and he has his detractors, more of which below -, he was almost singularly responsible for overturning the then dominant mode of historical/archaeological thinking which grouped societies not in terms of their evolutions in material and technology, but rather, seeing these as static, had no model or mechanism to explain historical change. Childe’s forebears – those whose work he undermined – imagined history in terms of a scale, with “barbarism” at the bottom and “civilisation” at the top. Childe showed not only that this was, in reality, far more complex and fluid, but that it was a process through which all societies were continually moving, and was able to provide a mechanism to explain how. Without his input at the time, we would have no conception of history as a process. More importantly still, he suggested that “the constituent events [of history] are interrelated and form an intelligible pattern” – he didn’t meant “determinism”, but rather that social development works through an understandable, evidence-based process. This “intelligible pattern” can be equally applied to describe the process of progress in Age of Empires and its successor titles, where you lead your culture through time – and against enemies – by following a particular path in the tech tree, by making resource calculations and military decisions. It is understandable, then, that Childe’s conception of history is so well suited to the real time gameplay of social and technological evolution that underpins Age of Empires. 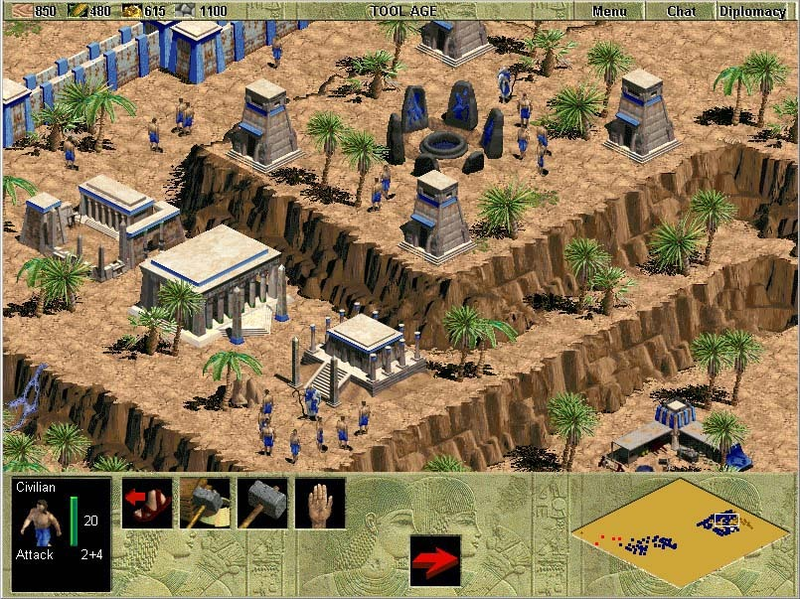 Because the culture unit (in AoE, the Greeks, the Khmer, the Hittite) of Childe’s model was essential and coherent, there is a ready connection to its becoming a playable civilization in AoE. The culture-specific unit types, bonuses, materials and buildings (and, ultimately, the Wonder) of the game share interesting echoes with much of Childe’s thinking about the relationships between culture, society, and technology. Childe’s notion that “all the groups of simple food-producers recognized by archaeology are distinguished from one another by very marked differences” then translates easily into the tribe/civilizations which the player is able to select at the start of each game. The accessibility of Childe’s model translates almost uncannily into the format of the Real Time Strategy game. As Angela Cox recently suggested in her article, historical simulators almost always raise the groggy question of “realism vs gameplay”. 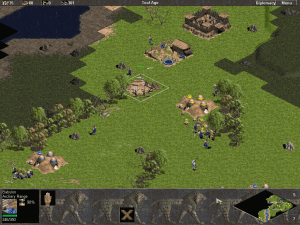 In Childe’s thinking, and in its strange echoes with Age of Empires, we see that an easy to grasp, difficult to master theory can sit inside an equally easy to play, difficult to master strategy game, a point where complex historical modelling – even if those models are incomplete or overturned – has a positive influence on the development on a style of gameplay. In other words, AoE, while acknowledging its abstraction of the past, is still an attempt to create a certain kind of historical realism – an understanding and modelling of how societies change through time. For doing this, it was – and remains – both compelling and innovative, and therefore escapes the “realism vs gameplay” trap. In his Man Makes Himself, Childe introduced and expanded upon his theory of the “Neolithic revolution”. As the period in which humans first began to systematically cultivate plants and to breed animals for food, this enabled an exponential increase in population, producing wider transformations in social organisation and of further technologies which were required to manage a larger population. Strategically, AoE is based on the same requirement – of accelerating a society’s strength and development through careful and systematic resource management. In the earliest stage of the game, the player can hunt for meat (lions, elephant, gazelles, etc), and forage for berries. At the next point, the player can build granaries, and thus steadily increase the resource pool of the society in order to support troops, technological advancements, and – eventually – the building of the society’s Wonder. As Childe put it, “the first revolution that transformed human economy gave man control over his own food supply”. Then, “man began to plant, cultivate, and improve by selection edible grasses, roots, and trees”. This “revolution” then “[affected] the lives of all concerned, so as to be reflected in the population curve”. Greater supplies and resources raised the natural limits on community size. Having established this foundation – in both Childe’s Neolithic as in the game – “a second revolution transformed some tiny villages of self-sufficing farmers into populous cities”, which allowed for “epoch-making inventions” such as “the plough, the wheeled cart, and the sailing boat”, followed by, “the chemical process involved in smelting copper ores and the physical properties of metals”, “and prepares the way for a civilization”. At the same time, there are latent issues with Childe’s model – not just that it was based on a patchy and poorly understood archaeological record (a limitation he himself admitted), but that his conception of discreet “ethnic” or cultural groups as the units of social-technological development was open to misunderstandings and manipulations, particularly from the perspective of nationalists, who saw such models as justification for their own culture’s coherence and historical “objective”. But why excavate Age of Empires at all? In one sense, it’s important to place the games we play – which help to build and influence how we see the world – within the intellectual and aesthetic currents which helped form them. While the game’s developers did not (as far as I know!) have a copy of Childe’s Man Makes Himself open next to their computer while coding and designing the game, AoE still emerged from a constellation of particular ideas about history that have a root in Childe’s thinking, as well as in his compelling and accessible writing. There was almost unanimous praise for AoE when it was released in 1997. 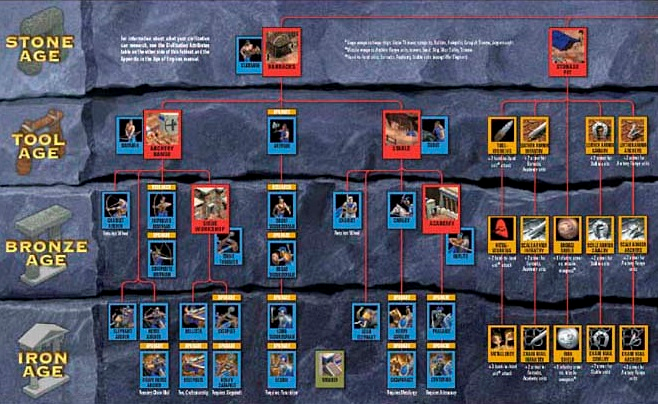 And yet, while as an RTS its engrossing and technical gameplay was singled out, there was a feeling that it was not really a “historical game” – Computer Games Magazine said it had, “a rather abstract rendition of [history]”. But as I’ve hoped to show, AoE was – and remains – important because it attempts to build a game around the complex process of historical change, of being active rather than static, of understanding the relationships between society, technology, resources and history in a theoretically sophisticated way. While Childe was dead a long time before even the first game of Pong was played, his thinking continues to echo through and shape the games we play, and thus our interaction with history. Wow! That’s kind of cool. I didn’t really know about the AOE model of pre-literate history (my own studies have mostly been modern) so it’s interesting to know that there really is a basis, sort of, for it.